Being far from home is difficult for everyone, especially children. We want every child who migrates to Lesvos to have a safe environment in which their hopes and dreams can be flourished. As part of our wish to preserve hopes and dreams, we have created an opportunity for boys and girls to run around, have fun, and smile. 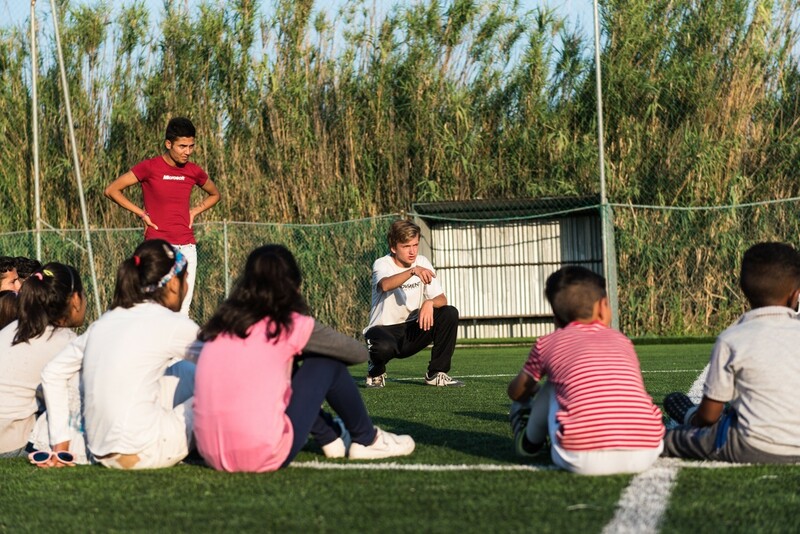 Our Football coaches consist of both volunteers and refugees who train using the F3 Methodology, a strategy introduced by Street Football World (UEFA). In 2017, Street Football World (UEFA) initiated and financed the football program on our campUS. The F3 Methodology brings out the best sports has to offer: an opportunity to socialize with other kids, release stress and surplus energy by being distracted from reality for a little while. In the Movement On The Ground arena, every boy and girl shines like a star! We strongly believe in creating hope within every child residing in our CampUS's. Our football program is just the beginning of many more projects to come. We are working hard to maintain a safe environment for children. For more information on how you can contribute to our Movement, click here. Would you like to join our volunteering program on Lesvos? You can click here to fill out an application form!